A powerful quake measuring 7.8 struck Monday close to densely populated areas of southwestern China, toppling buildings and rattling cities across a large swathe of the country and southeast Asia. 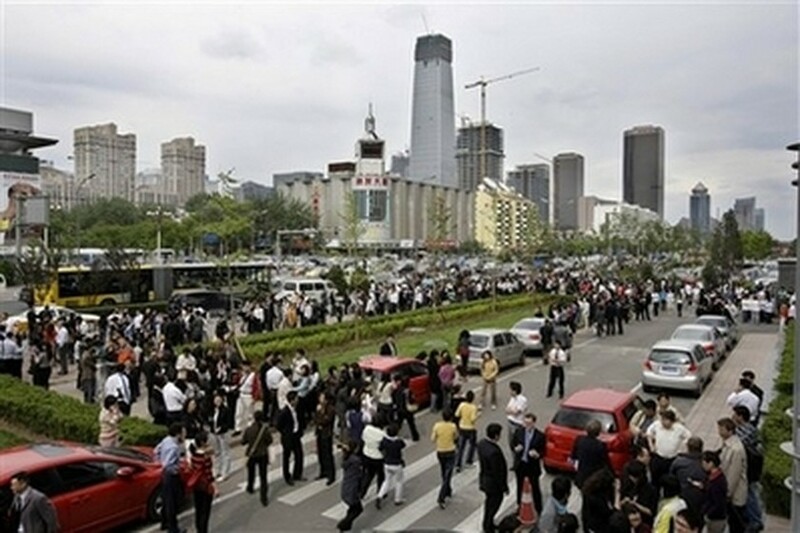 People evacuate office buildings after a 7.5-magnitude earthquake in Beijing Monday, May 12, 2008. Xinhua reported at least four children were killed when the quake toppled two primary schools in the city of Chongqing near the epicentre, with another 100 injured. The state-run agency reported that buildings had collapsed in neighbouring Yunnan province, and President Hu Jintao urged an "all-out" effort to rescue victims. Military troops were ordered to help with the disaster relief work and the international airport at Chengdu, closer to the epicentre, was closed. Xinhua said Premier Wen Jiabao was on his way to the region. The quake struck 93 kilometres (58 miles) from Chengdu, capital of Sichuan province and a major population centre with more than 12 million people, and about 260 kilometres from Chongqing and its 30 million. The State Seismological Bureau located its epicentre as in Wenchuan County, which is home to the Wolong Nature Reserve, the nation's leading research and breeding base for endangered giant pandas. Buildings shook in Beijing and Shanghai, residents in the cities reported, with many people evacuating tower blocks and rushing onto the street, although there were no immediate reports of damage there. Tremors were also felt in Bangkok, Hong Kong, Hanoi and Taipei, residents there said. China's state-run Xinhua news agency reported the quake 7.8 on the Richter scale. The US Geological Survey, which uses a difference scale, also measured it at 7.8 after earlier revisions. Xinhua said the quake made buildings collapse in the neighbouring province of Yunnan, adding there were no reports yet of casualties. A reporter for CCTV news in Chengdu said residents had poured out onto the streets but public transport and electricity supplies remained operational. However, the tremor appeared to have disrupted cellular telecommunications in the city, he added. State television also said there appeared to be no infrastructure problems in Chongqing. The phone network in Chengdu and elsewhere around the country appeared to suffer a meltdown as people throughout China tried to find out what happened, making it extremely difficult to contact residents.